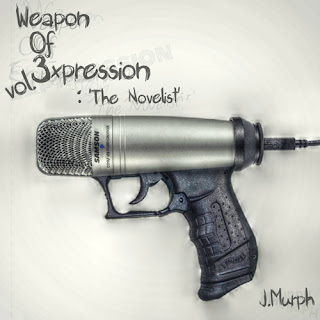 Central Florida artist J.Murph released his third installment in his Weapon of Expression series The Novelist. Inspired by the movie Finding Forrester; J.Murph exclaims "as I continued to watch the film, there were some things that stuck out to me that I didn’t notice the first time I viewed it. There were so many similarities to Jamal and I. Even some of his friends shared similarities to some of mine. The weirdest coincidence being his best friend in the film’s nickname being “Fly”. My closest friend from middle school to high school’s nickname was “Flya”, and often times I called him “Fly” for short. As if the names weren’t close enough, they actually looked and dressed a lot alike. I thought to myself “How didn’t I see this?” Then I began to write."